Part 1 of A Car Story is here. I didn’t need the Aries K car I’d been left with after my first big break-up. If I’d sold it, I wouldn’t have made enough to pay off the car loan. I was well and truly stuck with it! On the other hand, since I was no longer supporting someone, I could more easily pay for it. I focused on paying down bills for a while. I liked shining up my Acura. And wearing my Def Leppard T-shirt. A few months later, I met a local man, and was encouraged to put down roots in my new city. Before long, we had bought a home, sorted out new cars and got married, in that order! The new hubby, whom I shall refer to as DG, was a higher-echelon professional than me, and quite liked luxury goods. He drove a lovely Acura. I was easily persuaded to trade in the K car for an entry-level Acura Integra! 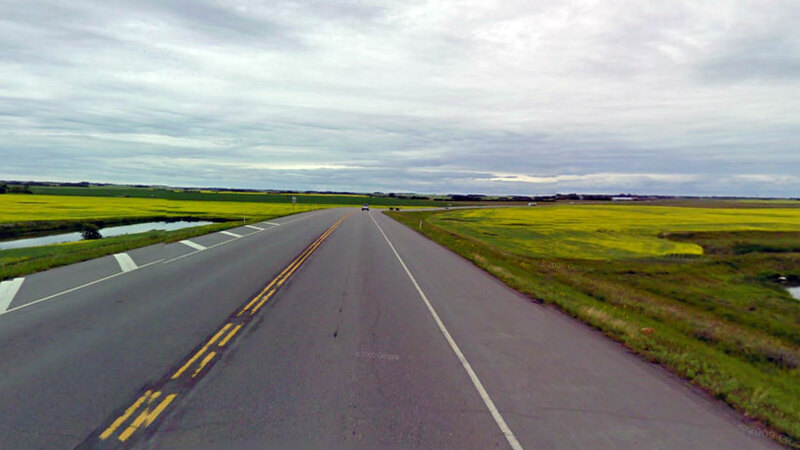 The location of our new house made it necessary for each of us to have a car for commuting. So far, so good! 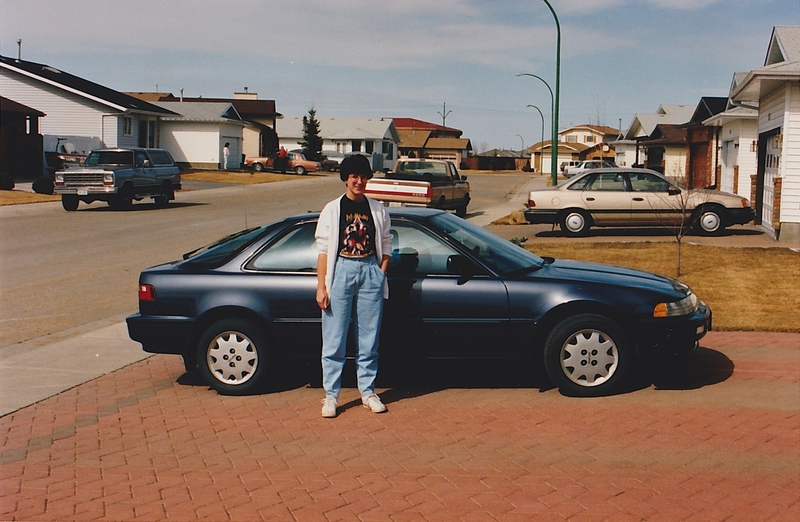 The Integra was a sporty car with great handling and I loved driving it, especially out on the endless prairie highways of Saskatchewan. In fact, I liked the car so much that I hand-washed it every weekend! As I alluded to in some previous posts, it soon became evident that DG had a significant substance abuse problem. However, we “hung in there” with great hopefulness for a number of years. As soon as Link was born, it became starkly clear that the baby could not be left alone at home with dad, or go anywhere with him in his car. Meanwhile, he was still pulling off a successful career and was transferred long-distance twice. I took the calculated risk of leaving my good job and going along. This allowed me to stay at home with Link for a while and to re-establish my career back on the east coast, closer to home. For the second of these transfers, we moved from Canada to the US. I had to sell my Integra because it didn’t meet the requirements to be imported into the US, without expensive modifications. We purchased a large, semi-rural home in Massachusetts. Although it was only 5 miles from DG’s work place, it was also 3 miles from the nearest corner store, or any services whatsoever. He worked from 6 in the morning to 7 at night, and I was at home with a baby and no transportation. Because DG could not think clearly and was not able to be empathetic, we were often low on groceries for days at a time – he wouldn’t come home early enough with the car to go grocery shopping. Or he would come home impaired so we couldn’t go out. Although I didn’t think of it as an abusive relationship, it was controlling – he didn’t want me to drive his car and drop him off at work. In retrospect, I think he knew I would leave him due to his escalating issues, and he wanted to delay it. Since I wasn’t working and had no credit rating in the US, I needed DG to sign for my next car loan. Stalling tactics were employed and I was at home without a vehicle for over 6 months. You can guess what happened next. I promptly went out and got a full-time job and got my ducks in a row. We separated shortly thereafter. I bought a mini-van. They were all the rage and that was just “what moms did.” I wanted to be able to drive my family around when they came to visit, and to take long road trips to see them. It was certainly a safe vehicle for that. It likely saved my life once when a car made a quick left turn in front of me and I “T-boned” it. The heftiness of the mini-van worked in my favour. On the other hand, I didn’t feel good about the damage it did to the offender’s small car. If you’ve read some of my previous financial posts, you know that DG died suddenly of an overdose. Despite all of our trials and tribulations, I had sincerely hoped he would get healthy again and be a good dad even while we led separate lives. I stayed put in the US to give Link and me some continuity while I made future plans. 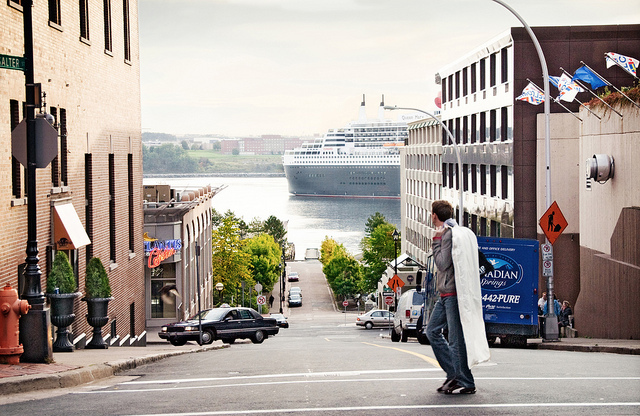 Two years later, we packed up the mini-van and transported ourselves and our two cats back to Nova Scotia. I kept the mini-van for its entire life span. When it gave out, I looked forward to buying a small commuter car. I was no longer going on road trips or hauling family around since I lived near them. 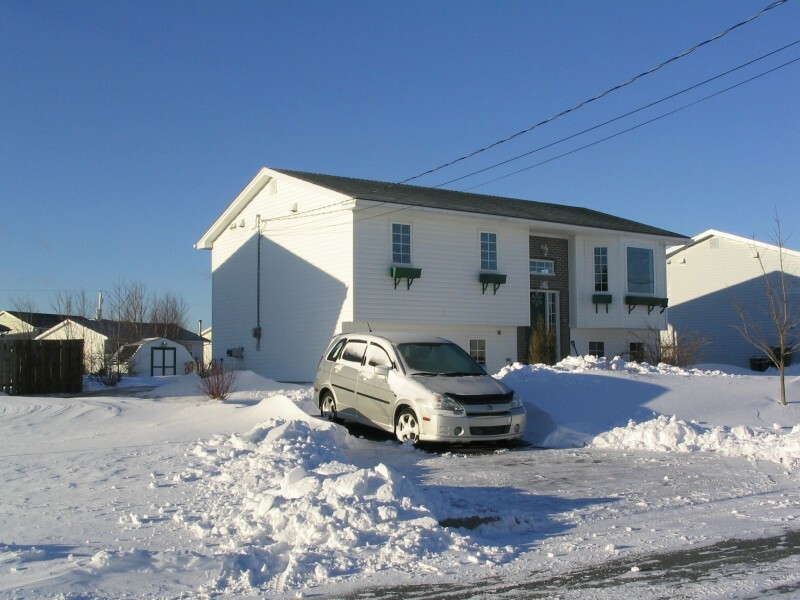 I bought a Suzuki Aerio All Wheel Drive hatchback, which was more like a small station wagon. I hoped the Aerio would last me 10 years. Unfortunately, because of poor repair decisions by the dealership, it only held out for 7 years. It was wonderful to have a small car I could park anywhere, and it was far cheaper to fill up, too. That Windstar van had a 98 litre gas tank!! I hadn’t tried an AWD vehicle before and it tested out well in the snow and ice. Link learned to drive in this car and I felt confident having a teenager out on the road with it – well, as much as one can feel confident in that situation! This past year when the Suzuki was done for, I didn’t need a family-sized car any more, and I wanted something more enviro-friendly. I took a pass on another AWD. They are much heavier than regular cars and use more fuel whether the AWD is engaged or not. 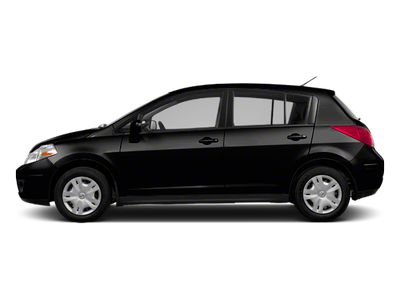 I chose my current car, a Nissan Versa, because of its energy-efficient transmission, small size and roomy interior. (Does that sound like a paid endorsement? LOL!) I put snow tires on it, and it has been handling great. I climb some serious hills on my way to work each day! Now I am hoping the Versa will last me 10 years. When Rom moved here, he intended to run his own business, and bought himself a car right away. As it turned out, he got a full-time job with an employer, and our workplaces are close together. So I drive him to work every day and take advantage of the free parking at the library. Rom doesn’t really need a car any more. He can sell his if he likes – I will be hanging on to mine! I will always have my own car until my little world is so small that I no longer need to drive! Do you have an emotional connection to cars or driving? Wow, what a great way to convey your story – and what a life it has been too! I think we all have a car story. You’ve inspired me to give it a go and tell mine. Loved this series. I too equated my cars with my freedom. This past summer I gave up having a car for the first time since I was 17. In many ways it makes me feel more free, but this time in a financial way. I hated crossing my fingers hoping an inspection would be cheap and easy most of all. Like you I refused to ever be dependent on any one else, especially a man. Btw, I am sorry for the loss of your son’s father, what a sad way to go. My eldest son lost his father (one he never knew) when he was 16 due to suicide. While he didn’t know the man it still affected him in a big way. Thank you for your concern. Link was 6 when DG died and it certainly impacted the course of a young person’s life dramatically. I am so glad there were good memories left behind, and best of all, DG’s entire family, who are our good friends to this day. That’s great that his paternal side of the family stayed close with you after the divorce I’m sure it helped a great deal for Link. I think, because I don’t have my own car, I make very influenced decisions about work and leisure and where I live, so that I can ‘manage’ with public transport. That is quite remarkable in Australia where distances are vast and public transportation is not excellent. Bravo for you for taking it all seriously and coming up with a solution that works! My goodness! That is quite a story. I totally understand how cars and freedom can go hand in hand. I went through all sorts of “car hell” as a young adult – mostly from poor purchasing decisions. I did learn to never EVER buy a used car without having it thoroughly checked out first though! I suffered through a Toyota with a cracked block, a Chrysler that burned more oil than gas, a Ford that had been driven for about a year with no oil (which threw a rod within a year or so,) and a Mazda that had a nasty habit of simply dying in the middle of intersections for no discernible reason. Finally, when I graduated from college I guilted my mother into buying me a new car (guilted because it was she who recommended all of the above used cars, which had completely and totally burned through my entire savings.) 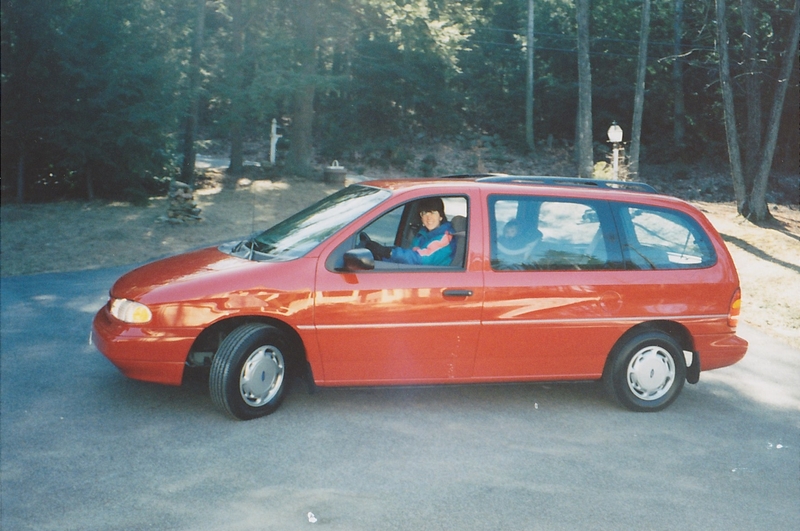 So she agreed, and I did my research, and we bought a brand spanking new 1990 Honda Civic wagon, and it has been the one and only car of my adult life. It only has about 85K miles on it, and since I drive so little these days I can’t see ever replacing it unless it gets to the point of being beyond repair. I think it’s gonna need a new transmission sometime in the next few years, but I’d much rather invest a bit of money to keep this car than roll the dice on another. I have had only new cars for the past two decades. Despite regular maintenance, they never last as long as I think they should. Maybe it’s our road salt. This is more than just the story of your cars, it’s the story of your life. And thanks for sharing the ups and downs, not many people do that on their blogs. I’m planning to share my story of cars on my blog at some point – I got my first car only three years ago but have owned three separate cars in that time – not by choice! The first car was 20 years old and the transmission died, the second one someone ran into and it got written off and we got an insurance payment, and I’m hoping the third one will last for more than ten years because I really hate shopping for cars! I was lucky to grow up in a city with excellent public transport and then later got into cycling, so didn’t really need a car until I was 25 and doing fieldwork in remote areas. Since having one though, I’m not sure if I would go back to not having one, even if I only use it once a week. Thanks. I would love to hear about your cars! I’m sure you won’t continue going through them at such a rate! You’ve been through such a lot…that is so sad that your son lost his Dad at just 6 years of age. I can definitely appreciate the link between cars, independence, livelihood etc. I love my car (and all previous cars) dearly…a very reluctant public transport user at the moment! Thanks. I have never been able to get a job, figure out where to live, and decide on transportation – in that order – it’s always been: find out where I am going to live, find a home, then get a job, then figure out transportation. Weird, huh? I love, love your posts! I really shouldn’t be so lazy and comment more! LOVE that def leopard tshirt! haha! I used to love them back in the day! I don’t drive, or have a car! I’m much to nervous, i’d be afraid of killing myself, or worse, someone else. lol! Wow, Dar. I just came back to re-read this while I’m in the middle of ‘new car buying.’ I do think that was an abusive relationship situation. It’s rocked me reading this again, now that I feel I ‘know’ you so much better than when I first read this. What a very rocky road you have travelled. And yes, cars are much more than just transport, especially for women. I’d love to be ‘car-free’ for environmental reasons (although vegetarianism would probably be an ever better choice in that regard.) But I know I would find it very hard to give up the independence and indeed the safety of having my own car. Thanks for the note, Fiona. In retrospect, I think so too, although I didn’t see it at the time. Emotional abuse and control issues are insidious. I have become very protective of my independence, whether through having my own job, own money or own car. Because of my past experiences, I will not be financially (or transportationally!) dependent on someone again.